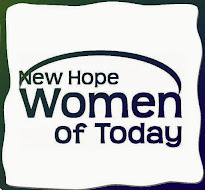 When you say you are a member of the New Hope women of Today, what do you want that to mean? As you ponder that question, I will tell you what I want it to mean for me. Someone asked me if I knew you. I laughed, and said, Ha! That’s funny!! I adore that woman!! She’s blessed, caring, loving, sweet, beautiful, a real woman of spirit. And she is reading this right now. This is how I think of each of you. As a group and as individuals you are a force to be reckoned with. I want to challenge each one of you to come up with your personal motto. It can be your favorite saying, a poem or song that speaks to you heart, or a phrase. Make it yours and live it each day. – Tawn H.